Today, Writers’ Rumpus is chatting with Brooke McIntyre, founder of Inked Voices, a website and tool that lets writers run cloud-based critique groups. Brooke is a writer, a reader, a business professional, and a mom of two little ones. I first met her online back in the spring, when the beta test for Inked Voices was underway. The site is now launched, and we’ve asked her to share a bit about Inked Voices and its journey so far. Marianne Knowles (MK): What is Inked Voices, in a nutshell? Brooke McIntyre (BM): Inked Voices is a web service designed for private, usually small, online critique groups. We help people find groups and then run those groups smoothly online. We’ve also just started a monthly lecture series on elements of craft to complement the groups. I started working full-time on the site last October, our beta launched in late March 2014 and we went live at the end of June. We’re still improving the site and continuing to introduce new features. MK: You said “we.” How many people helped create Inked Voices? BM: I’m the only employee, but I’m definitely not on my own. I work with Devartis, a software development company based in Argentina. My former colleague John Simoneau designed the interface through the beta and Elise Grinstead designs my site today. I’m honored to use my sister Barrett Martin’s talents as an artist for our drawings. Many others have shaped the site through their feedback, from my critique group members who heard the initial “what would you think if…” to the writers and group organizers who responded to my cold call at the early mockup stage. Inked Voices writers, especially our beta writers, have shaped the site with constant feedback—“we need this,” “it’s broken,” “wouldn’t it be nice if we could…,” and encouragement. The support of people who took a chance on this idea, who could have shrugged past, keeps me going on days where I’m throwing up my hands. 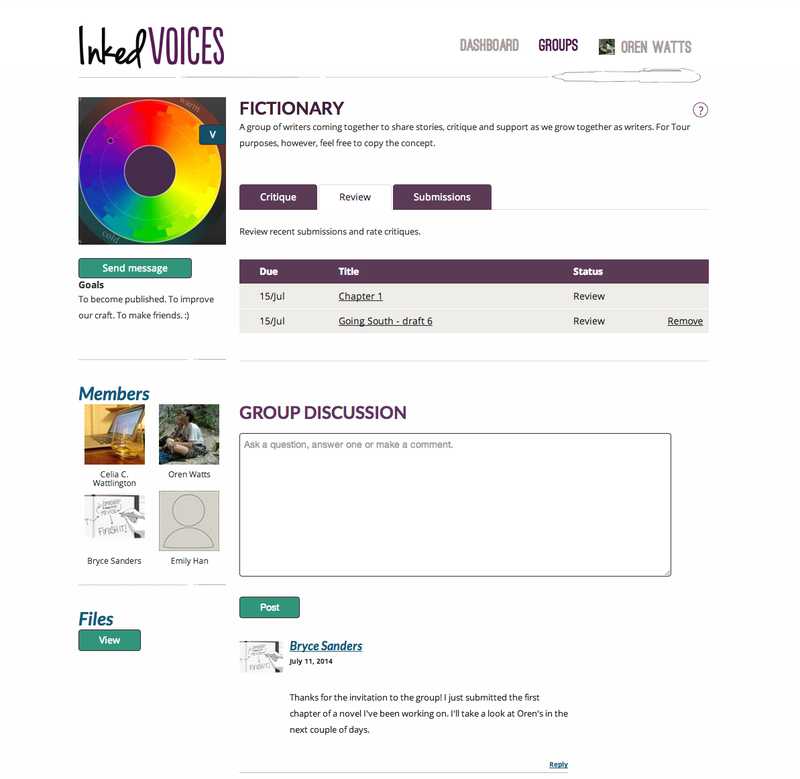 Inked Voices provides private, virtual spaces for writing groups to come together. MK: What inspired you to start Inked Voices? BM: I was at a transition point in the summer of 2012 and thinking about the next step in my career. I had recently helped to sell the company I was working for to a Fortune 500 business. We were on the cusp of an out of state move as my husband began looking for a post doc. And I was pregnant with #2. While waiting for career epiphany, I decided to take a step toward a dream I’d pushed aside: writing a children’s book. I started an online writing class when my daughter was a few weeks old. I liked it so much that I started a critique group with some women from the class. It was great. Knowing my turn would come up kept me writing. I loved getting feedback and the camaraderie of being in this journey together. But running a group over email was less than ideal. My business brain called it inefficient and ineffective. We were always forgetting whose turn it was and when things were due. Discussions and submissions were scattered across my inbox and folders. It felt disconnected. Although we were a virtual team, we needed a space to come together for organization and continuity. We needed a better mechanism to help us with deadlines. I wondered how many other groups experienced the same problems. And I wondered how many people out there would also want a group like this, because they couldn’t attend one in person because of where they lived or family or work constraints. It seemed like a problem I could help solve. And, surprisingly, it brought in elements I had been passionate about for a long time–education, coaching, small teams, running a business, and writing. So I began sketching. And Inked Voices started. MK: In addition to writing, you have a background in business and marketing. How has your professional experience helped you in launching the web site? BM: Before Inked Voices, I led branding for a successful company and was part of its management team. With this experience and my MBA, I knew what elements of the business would need to come together. But starting a business is different than working for a company that’s well off the ground. I’ve drawn more on my “soft skills” managing projects and small teams. And my marketing background. I’m experienced in researching, interviewing people and then translating that into the shape of a new product. Although the stakes are higher as an entrepreneur, I’m following those same processes. So for Inked Voices, I started out with a basic idea and sketches and then started talking to writers and writing group organizers. I made changes. Got more feedback. We built the product and tested it. Got feedback again. The iterative process of starting a business is a bit like drafting a manuscript and taking it through revisions. Beta writers advised on the site–as well as advising each other on their writing. MK: And the beta writers were a bit like the site’s critiquers. How did the site change as a result of the beta test? BM: The beta test helped me prioritize the site’s development. We had a basic product we shared with our beta writers and a huge list of planned features. As soon as they started using the site and making comments, the list was added to and reshuffled. This is what happens today too, but it was much more drastic early on. With writers’ feedback, we focused hard on the core of the application—the groups’ private pages and the critique interface. These are the places where people spend most of their time. For example, comments appear inline, are highlighted by reviewer and filterable by the same. And inline comments are printable. That was a big one. I said, “but you can’t do that in Google Docs.” But people pushed for it and I had to agree that, as a writer, it was kind of a big deal. So it happened. MK: How are you making Inked Voices visible to potential members? BM: I’ve found that Inked Voices is best fit for those who want to make an ongoing commitment to their writing. The Gotham Writers Workshop, which offers great online classes for writers, has mentioned us in its newsletters a few times and that was helpful. We are also sponsoring NaNoWriMo. I’m so impressed by everyone who takes this challenge. We sponsored Camp this summer and I’m looking forward to November! I’m also posting some free resources like this one-page critique guide to build some awareness of who we are. Some of our writers have kindly handed out postcards for the site, too. MK: What do writers need in order to use the site? BM: A passion for writing. A willingness to exchange and share among a small community of writing peers. A goal to improve your writing. An internet connection and device. Inked Voices costs $10 per month or $75 per year (comes to $6.25 per month). This includes participation in one or more groups and the monthly lectures on craft. I also extend discounts to existing groups that want to try it. Some have asked, why not offer it for free? Full-time software development and professional design are expensive. Ads couldn’t have supported the site and our beta writers didn’t want them. Paying a fee also means that the writer has a stake in the group—just like you’re more likely to attend a class you pay for. That’s also the reason for the discount for the annual version. Groups benefit when individuals make a longer term commitment. MK: How do writers join groups? BM: Writers search for groups by keyword, e.g. fantasy, picture book, memoir, SCBWI. After looking at the groups that come up in the results and identifying a fit, writers ask for an invitation. 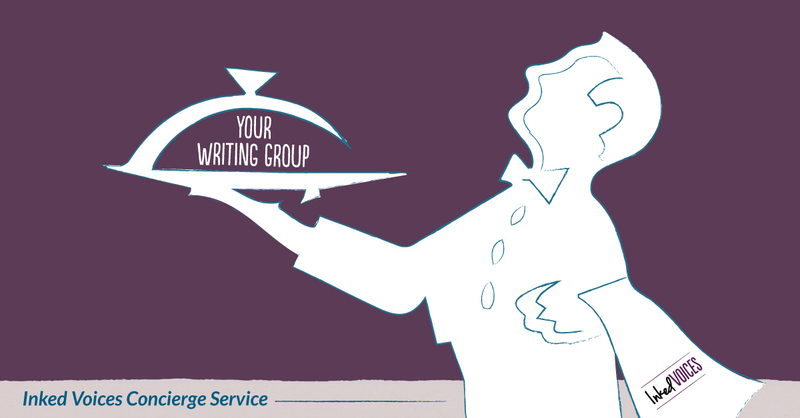 If someone doesn’t see a good fit, the writer can create a new group. Because the site is new, I will make that person a free user until their group has 3 or more writers. When a new person joins, I also reach out personally. I look at the person’s profile and make suggestions for groups or individuals that might be a good fit. I’m also doing something called Concierge Service through December for writers who want additional help finding an Inked Voices group. Writers fill out a questionnaire about what they are looking for and I email them when there is a matching group. MK: I hesitate to ask, but have you found time for your own writing and critiquing, since starting the site? BM: This has been a struggle. I’ve kept up with all of my critiques. But finding time for my own writing has been more difficult since the site went live. I don’t have an 8am-5pm schedule anymore, so I have to be more purposeful about defining time. I’ve gotten some new ideas down this fall including a couple of chapters of a novel. I’m surrounded by WriMo’s on the site and it must be seeping into me. 🙂 Whether I will keep going on said novel is TBD. MK: Anything else you’d like to share with our readers? BM: For people interested in critique groups, whether on Inked Voices or otherwise, we are creating a Writing Groups 101 guide for starting and running critique groups. It will be posted by mid-November. Thanks for visiting Writers’ Rumpus, Brooke. And thanks for helping to sponsor NaNoWriMo! Best wishes for the success of Inked Voices.